People from all walks of life – from office administrators to handymen, award winning jockeys and financial analysts, are throwing in the towel for an opportunity to call the shots on how things are done, running their own business. Whether it’s an unsatisfactory work situation, the need for a change of scenery, a redundancy payout, or the desire to be your own boss, more people are looking to franchising to take control of their lifestyle. “My prior workplace promoted a culture of bullying. It was a difficult work environment to be in, and the prospect of turning up to work every day was less than inspiring. 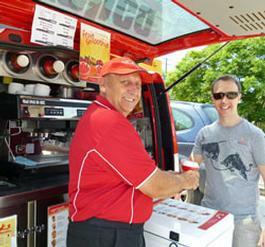 The idea of a franchise really appealed to me, as the business is mine to run,” said Darrel Lancaster, a former financial analyst and franchisee at the world’s largest mobile coffee service, Cafe2U. For David Ovens of Archfield, QLD, it was being made redundant for the second time at age 59. Working as a facilities co-ordinator with Woolworths for four years before being told his position was going to be made redundant seemed like déjà vu. Prior to assuming his position with Woolworths, David had worked for Unilever for 30 years before being informed his position was being made redundant. While the idea of being your own boss is certainly appealing, being a franchisee is no bed of roses. There is no longer a fixed salary, meaning if the business isn’t performing, you don’t get paid. The highs and the lows are yours to shoulder. “I remember the initial nervousness of being my own boss,” explained Glenelg franchisee John Prasad. For anyone considering purchasing a franchisee, Prasad has one piece of advice. With owning your franchise, comes the opportunity to succeed and grow on your own terms. Don’t reinvent the wheel. Talk to other franchisees and absorb the mistakes made and lessons learned. Have enthusiasm and be tenacious. This is your business and no one can make it work but you. Educate yourself. Study what makes a business successful, research your audience and keep an eye on what other competing businesses are doing. Don’t try and keep up with the Jones’. While it’s healthy to keep an eye on competition, don’t try to match everything they do. Focus on what you have set out to achieve. Have a safety net. There will be prosperous months, but there will also be lean months, so ensure you have extra funds to float you through the tough times. Remember you’re part of a bigger picture. Some major business decisions may be beyond your control. Gemma Rasmussen is a Sydney based writer whose work has appeared in publications across the globe - from national newspaper Japan Today to Australian fashion rag Catalogue, and everything in between.